I stood buffeted by the wind, wishing I was a time traveller and able to see my long-departed mum, more than half the age I am now, down below and out and about in the Carnish / Carnais area. I would have hurled the stone I had picked up right across Loch Riobabhat, to far-below Carnish crofts. Yep, not just controlling time but also the laws of physics. In my mind I was aiming at the pugnacious ram that used to hassle mum as she walked past the abandoned blackhouses and down to the Red River (Abhainn Dearg) estuary. That ram vexed her. It got so she would wait for my dad to return home from nearby Aird Uig airbase, before she would go for a long walk. No doubt slowed down by carrying twins and her diminutive, 21 year old frame. But I didn’t throw the stone, I kissed it twice: one for her, one for him and placed it in a gap in the cairn. I had walked a couple of miles up to the summit from the small passing place where I’d left the car, near Cnoc a Charnain. The walk-in started with a distinct peat cutters’ access track but then saw me picking my way between differering degrees of boggy ground and snow-covered rocky sections. This was a walk I was always going to do (based on dad’s reminiscences) but it also featured in the excellent ‘30 walks in Harris and Lewis’ book. The book suggested that I ‘head to the top’ as a route instruction (e.g. there’s no clear path). I picked out a route across less saturated ground and did a minor amount of scrambling at one point. Some Marsden compadres were on the Skye Cuillins at the same time – doing far more dangerous climbing. I had a chuckle at my own ‘adventurous’ efforts. The remains of the recent snow did mean a bit of extra effort though, as I stepped carefully from rock-to-rock up a long gully just before the summit. I could hear melt water gurgling somewhere below me under the rocks, sounding like distant voices, as I picked my way uphill. I mused about that over a snickers and coffee and out of the wind a few minutes later. Maybe that explained the distinct but bodiless voices I had heard twice since arriving on the islands? On both occasions I had been the only person around for miles (once near Lickisto and the other near the North Harris Eagle Observatory). There had been a burn near the Eagle observatory track, that was probably ‘the man’ that I heard talking. Not so sure about the woman’s soft voice I thought I had heard. I had been stood with my back to an abandoned Lickisto croft, admiring the sea loch views when I heard her. I still have a ‘hmmm’ moment as I recall that peaceful but unusual moment. Enough of ethereal things and back to Suaineabhal. A brief flurry of sleet on the summit broke my ruminations around the cairn, time to head off. I descended south-east then back north-east around the flank of the hill. I then clipped the northern end of Loch A Phealair Mor. I had disturbed a Mountain Hare en route and it stayed put long enough for me to shuffle forward and get a couple of photos fired off. I hadn’t seen any red deer on the walk but the Hare was lovely to see and gave me my wildlife moment. It had drizzled for most of the five-hour walk so by the time I got back to the car I was fairly soaked but looking forward to visiting Carnish itself. But before that I dropped in on the new (ish) Red River / Abhainn Dearg distillery (The Red River area is allegedly named after the bloodshed between the clans and their Norse occupiers (http://www.beachbaycottage.co.uk/cottage-inspiration/myths-a-legends.html). I had an enjoyable, instructive chat with one of the owners and it’s great to see an old craft (albeit in the guise of a giant chemistry set) being brought back to life. And yes a souvenir bottle of three-year old Malt sat in the car, as I explored the Carnish area for the rest of the afternoon. The croft where the folks lived (rented) in the 60s.. 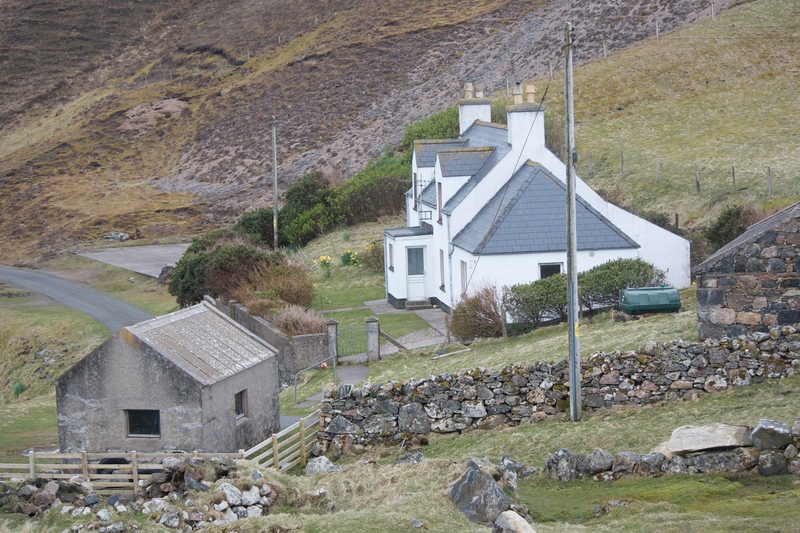 Abandoned blackhouses in the Carnish crofts area. Whilst in The Aird Uig / Carnish area I spent two nights at SEAcroft B&B. Great hosts, fantastic home cooking (restaurant standard actually) and an excellent base for exploring this part of the island: highly recommended. Some shots from around Aird Uig below: including the old RAF Base where my dad was stationed before I was born. Some of the buildings re now private houses. A lovely post and atmospheric pictures. Reminds us of our time living in the Scottish islands. We too have heard what seemed like voices or singing when we have camped near running water…a strange, unearthly experience!